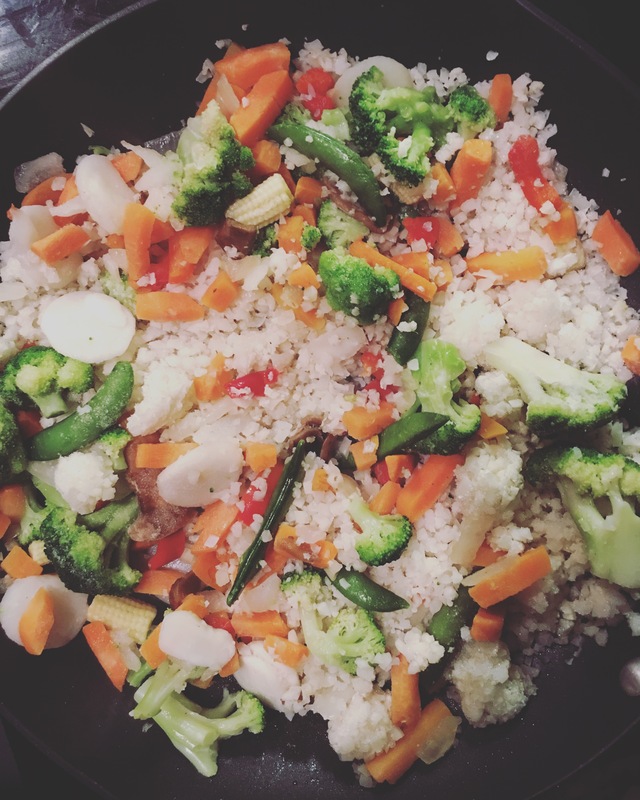 This week I am sharing a great recipe my sister recently taught me that features cauliflower rice – a perfect substitute for rice or pasta when looking to reduce your carbohydrate intake. This recipe is great to curb those chinese or thai takeout cravings, easy to make and great for leftovers. Add in more or swap out other veggies of your preference and even swap the chicken for chickpeas or tofu to make vegetarian! Dice up raw chicken into small bite size pieces. Saute in a medium heat pan with a heaping tablespoon of coconut oil, cumin, chilli powder & salt and pepper. After chicken is browned on either side/ mostly cooked, throw in onion & garlic, cook on medium until onion is translucent and chicken is cooked thoroughly. Reduce heat to a simmer – add cauliflower rice, carrots and brussel sprouts. Cook until most of the moisture is gone, add frozen peas. Season with additional salt & pepper and 2 tablespoons of soy sauce. Meanwhile, in a separate non-stick pan, cook 2 scrambled eggs . Mix in the eggs with the rest of the stir fry; serve in bowls with additional soy sauce as desired! Yum! We have been looking for a new dinner recipe and this looks great. I bet you could make your own cauliflower rice pretty easily, too!